Thanks to Style Weekly for sharing The Magic Wand Project with Richmond in this week’s issue on news stands now. You can read the article here. * I am so grateful! You can read about the Kids project here. We are inviting kids to discover their kindness magic and do 3 acts of kindness and then pass on the wand or hide it for another kid to find. What is so crazy is that in less than a week, Magic Wands are popping up in Kansas, Washington and all over Virginia. Those 2 phrases go on repeat in my head for the first day…but today, things are settling and kindness is moving despite my crazy head conversations. The Magic Wand Project is a social kindness experiment inviting people to discover what they love and care about in their city and community…AND consider where they might share their magic to make the place we live better. MAGIC! The Magic Wand found you, yep YOU! 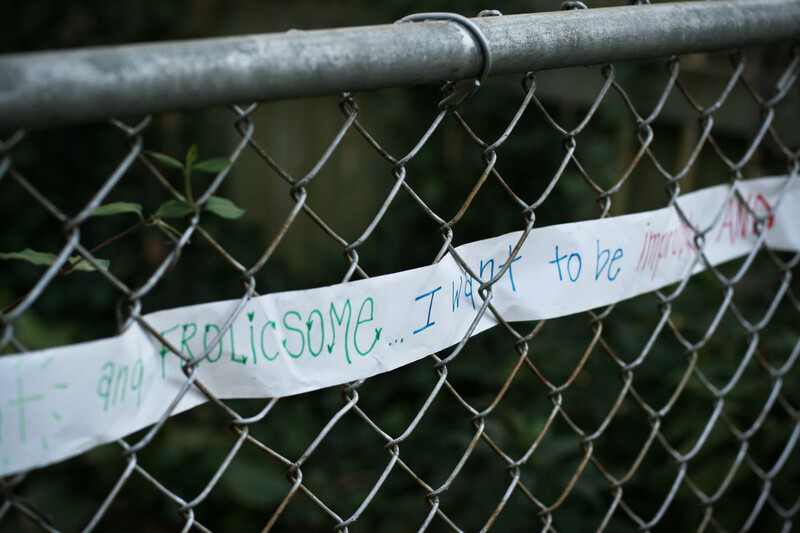 We then asked people to tell us here at KindnessGirl and then leave the wand somewhere else for the next person to find. 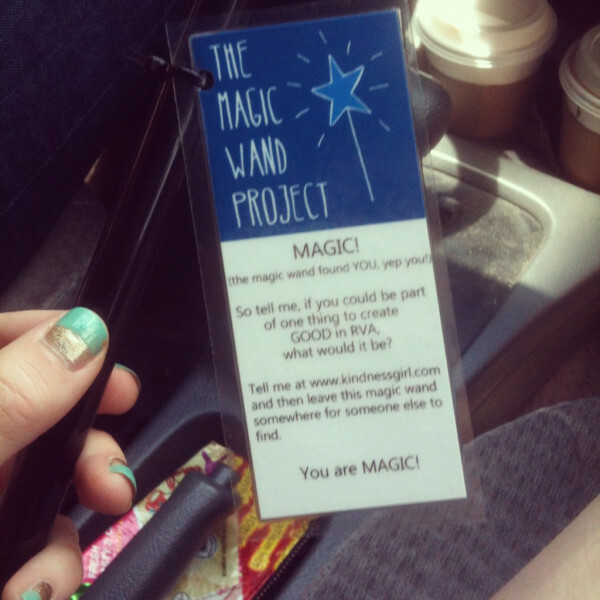 The Magic Wand Project For Kids is a project where kids can discover their kindness magic can change our world! 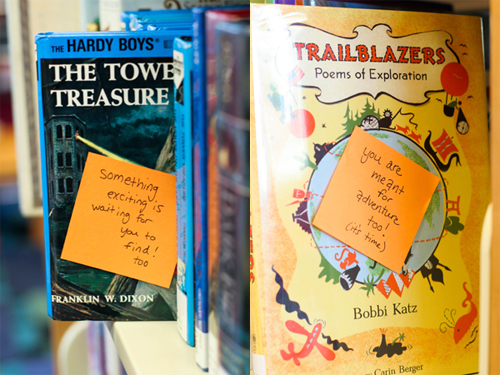 We left 100 Magic Wands at playgrounds, parks, libraries and other places kids might find them. 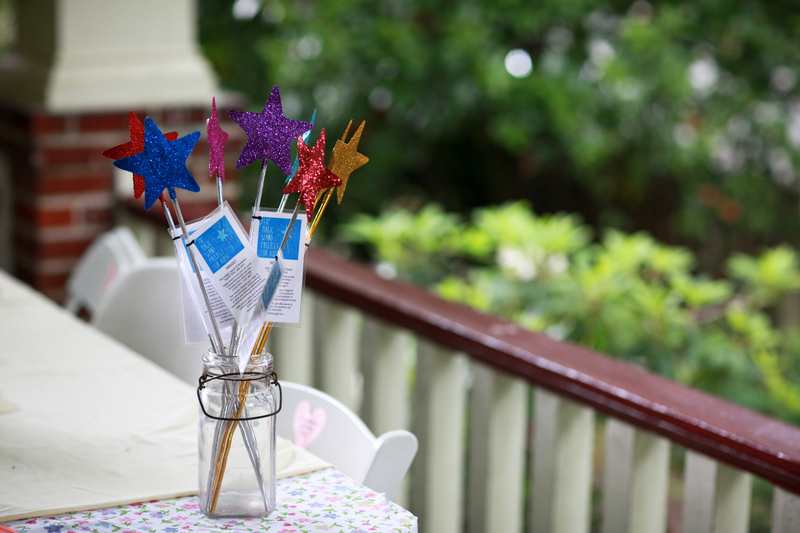 The Magic Wand of Kindness found you, yep YOU! “Magic doesn’t come from the world, it comes from people, and their kindness, that’s where magic comes from.” -Jack, age 7. After you are done, give this wand to a friend or leave it for another kid to find. Have fun! It’s going to take a little bit of time to get the projects rolling but I was SUPER stoked when someone on Twitter (my new friend Sarah!) had already found a wand and sent me this pic! Then I went to take a kid’s wand to my children’s school this morning thinking they could pass it around and get some kindness going when the very rad art teacher Anne suggested ALL the kids make wands to leave in their neighborhoods and playgrounds. Just like that, kindness wands doubled in the world. SOoooo, I don’t know what is happening you guys, but something is definitely happening…and it’s changing everything. What do you think the most thankless job in America is? I had my own idea but decided to take an informal poll among friends, family, and of course Facebook. It turns out, garbage collectors won by a landslide. I can’t say I was surprised. From Thanksgiving to Christmas, we create an additional one million tons of waste, which is a whopping 25% more that our collectors have to pick up and haul away. These are people that are part of our lives, in our backyards or front sidewalk, taking away all our decay, the stuff we don’t want or no longer serves us. Yet even though these guys are in my living space every week, I really had no idea what they might look like or what their names were. I started to wonder so I woke up early one Friday morning and waited for them to roll down my alley. I must have looked like a total loon waving my hands and carrying my camera but they stopped the truck and hopped out at my back gate. I introduced myself while Vejay, Lionel and Joe pulled off work gloves to shake my hand. 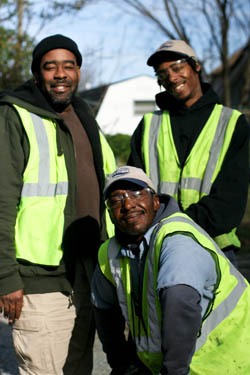 We chatted for a moment and I told them I was interested in doing a kindness project for garbage collectors. I asked them what kind of kindness they thought was needed. “Yep, pretty sure everyone needs and deserves that, huh?” I replied. “Yes, they do. Yes they do.” Joe said. The kindness mission was sparked. What could be a more lovely and simple message of respect than saying, “I see you, I value your contribution to my community and I thank you.”? Sometimes it is the smallest act of kindness that makes the greatest impact on a person. Meeting a basic human need may be all it takes to make a change. All I could imagine was Joe lifting can after can with notes of gratitude attached, throughout an entire neighborhood, maybe even a whole city. So I asked the kids in my daughter’s kindergarten class if they would like to join me in writing thank you notes since they had just been learning about community helpers. The kids were stoked to take the mission on and the kindness started moving. Word traveled and seven more schools wanted in. 1. 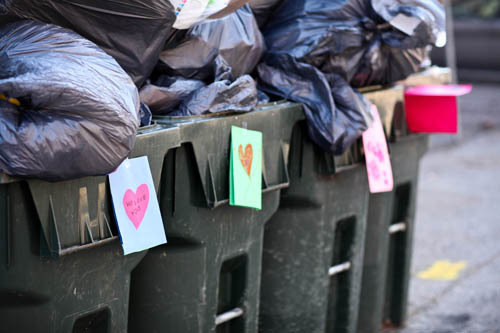 Write a note of thanks to your garbage collector sometime from now until February 3rd. 2. You may want to include a gift card for coffee from your local coffee shop or gas station. 3. Attach it to your garbage can on pick up day for your collector to find. 4. Take a picture and send it to patience@kindnessgirl.com or upload it to our Guerrilla Goodness Flickr pool. 5. Tell us in the comments what city you are from so we can see how far our garbage gratitude is traveling. 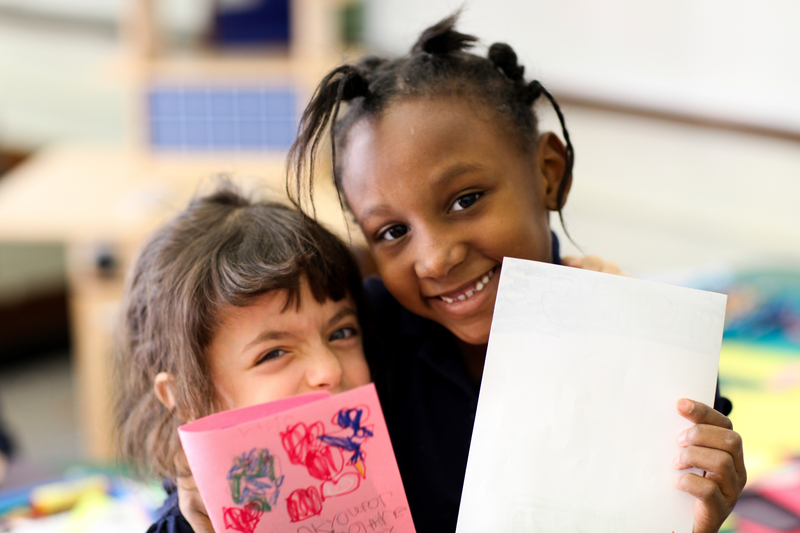 If you invited your school to join us, let us know the school too. 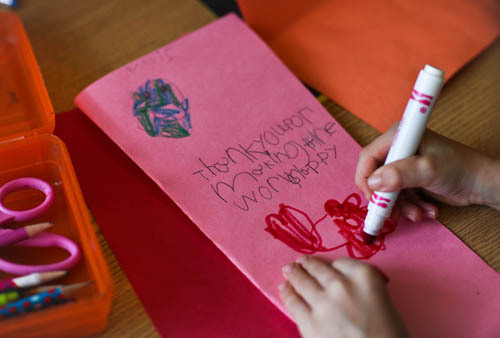 Some schools are including their custodians in on the thank you note kindness too! 6. Hit the Facebook or Twitter button below to share or like…we all know Facebook and Twitter rule the world! Can you imagine if there was a wave of gratitude across an entire nation? Garbage collectors may get kicked off the top of that most thankless job list. I imagine Joe would be just fine with that. I love the idea that messages are left in the world for us to discover. I was reminded of this one via my friend Jaime, I’m not sure she even knows she passed it to me, but she did…that Mary Oliver gets my gut and heart every time. I bought some register tape (about 2.5 inches, maybe less) for the kids as part of our art studio and stumbled upon it the other day. It’s wonderful when something can go on and on, even longer than you imagine. 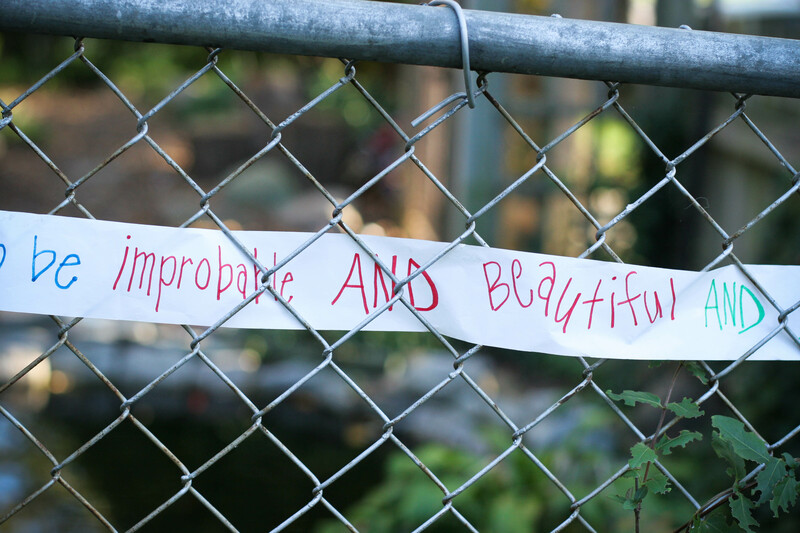 I realized the paper is also the perfect size for in between the chain link fence- my guerrilla mind exploded! 2. Buy some register tape- any old office supply place has them. 3. 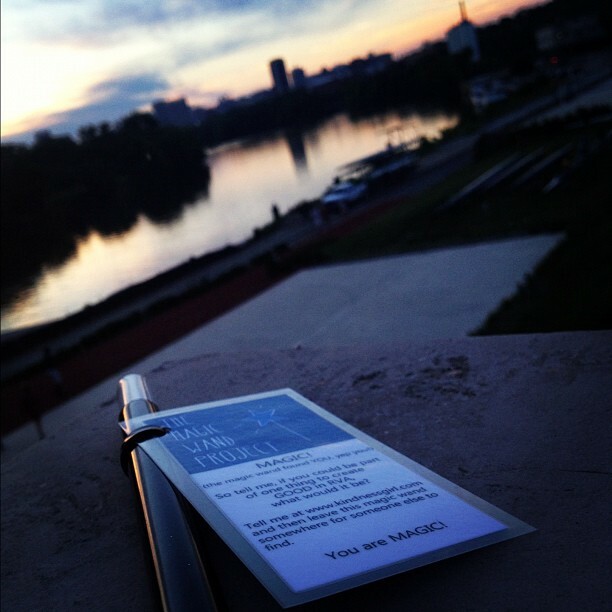 Write a quote or a message to the world, yourself, a friend…leave a few. 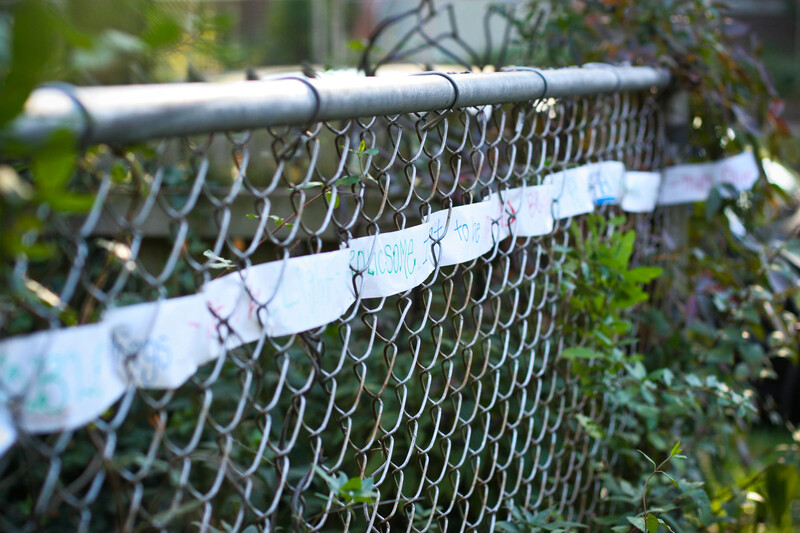 They also work on wood fences but need more space for the words and are a little trickier to thread through. 4. This mission is a little harder to do with out getting caught because it takes time to get it securely weaved. Plan it for some one when they aren’t home (and NOT on the neighbors fence!) or go early in the morning to a park, or other public space- night may get you in trouble. Also be sure to pick up your trash in a week or two, or after the rain. Oh! and don’t forget, our Dinner with Jimmy Mission ends on October 18th! You can still e-mail me your pics to be forwarded on to Dolores. It’s back! 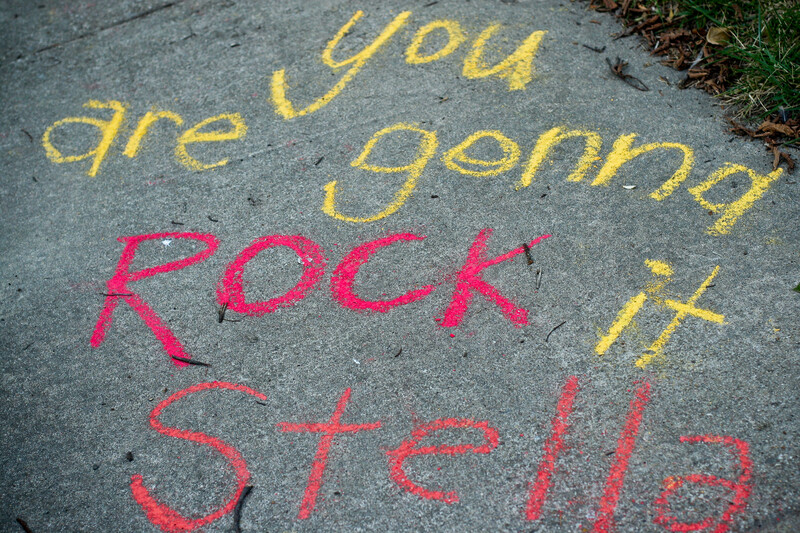 It’s time for the sidewalk chalk love again friends! 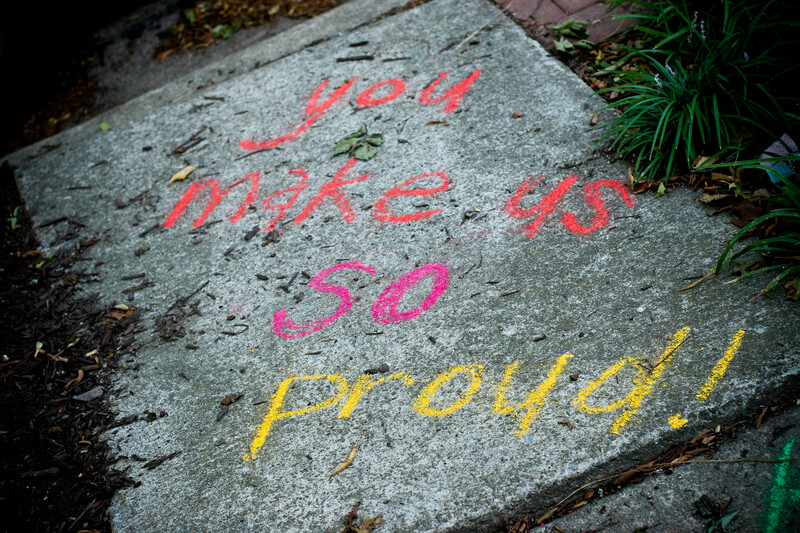 You may remember when hundreds of folks ALL over the country headed out with sidewalk chalk to encourage the kids of their cities and towns on the first day of school. Well, we are doin’ it again and would love to have you join us! I don’t know about you, but I could never sleep the night before school started. I wondered what my teacher was going to be like, who I would sit next to, what the work would be. It can all be a little overwhelming. Everybody could use a little encouragement, just a little reminder that you are loved! 1. 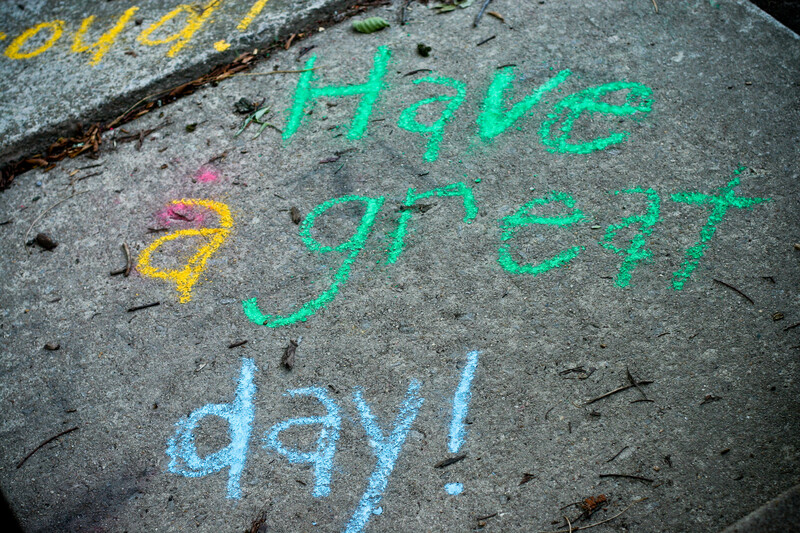 Grab some bright sidewalk chalk. Have a GREAT first day of school!! It’s going to be a awesome year! if you want more ideas, check out the pictures of what other people have done here. 3. Go home blissed out with the kindness high! 4. If you are a kindness kid, be super quiet when you are walking to school the next day and everyone around you is talking about the cool art out front… and smile. 6. If you decide to do this project or blog about it, please leave a comment so we can highlight your kindness work and watch it grow! Don’t forget to send me pictures and I’ll post them or simply add them to our GG Facebook Page. Also, if you want to learn about school kindness trees, my friend Chris had this awesome idea! *go at your own risk…be safe, go to familiar places and with others, ask permission if needed, be smart and respectful. It’s more fun that way! Can I tell you I am the world’s worst library citizen? …I almost always have a late fee, I lose a book at least once a quarter, and I’m never sure exactly where my card is. Even still, the library, in all her grace, continues to let me try again. and again. and again. We had a full day of kindness adventures, a marathon if you will, while working on a big kindness project for the fall (which I can’t wait to share!) and we found ourselves at the library. (with a gaggle of kids, dear friends and neighbors) This little outing was after the free slurpee day which meant it was almost impossible to be quiet, but we did our best- there was just mass amounts of excitement over red and blue frozen drinks and new books! 1. 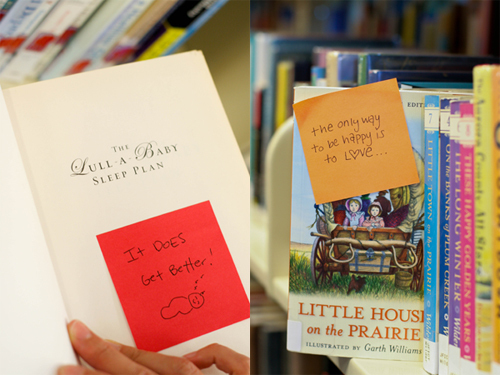 Take your trusty little post-it note pad to the library. 3. Trust the universe to send the right book and message to just the right person! The best part is, you don’t even have to have a library card, or check anything out for this mission, perfect for a library slacker like me! If you decide to do this mission, leave us a link to your blog or pictures in the comments…or upload the pics to the Guerrilla Goodness Flickr Pool!Check out more Guerrilla Goodness missions here! 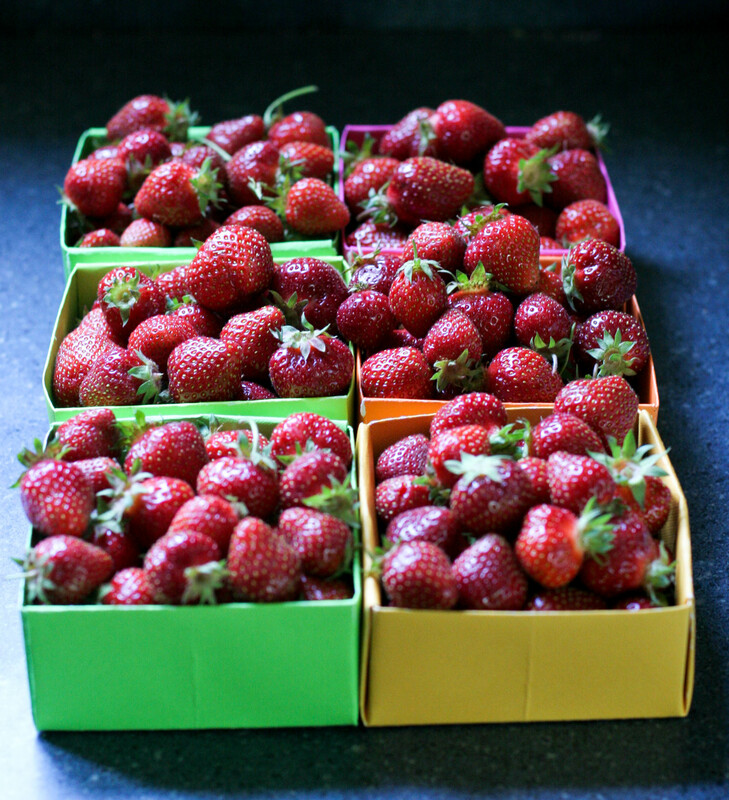 I can’t tell you how all of me gets rearranged and made right when I go for the first day of picking berries. Because I know, it is just the beginning of a long, wonderful season. I sing the in field, I watch my children play, I feel close to the earth and my truest self, I can barely wait to give them away, I feel so connected to everything…it is the ultimate kindness to me and one I have no trouble receiving. *sigh* I can’t even TRY to not be cheesy about it all…I am totally smitten. Here are the little giveaway boxes from the first pick. You can find the origami tutorial here. I use heavy cardstock like you use for scrapbooking- works fantastic! If you are in Richmond…and you need a little something extra this week. 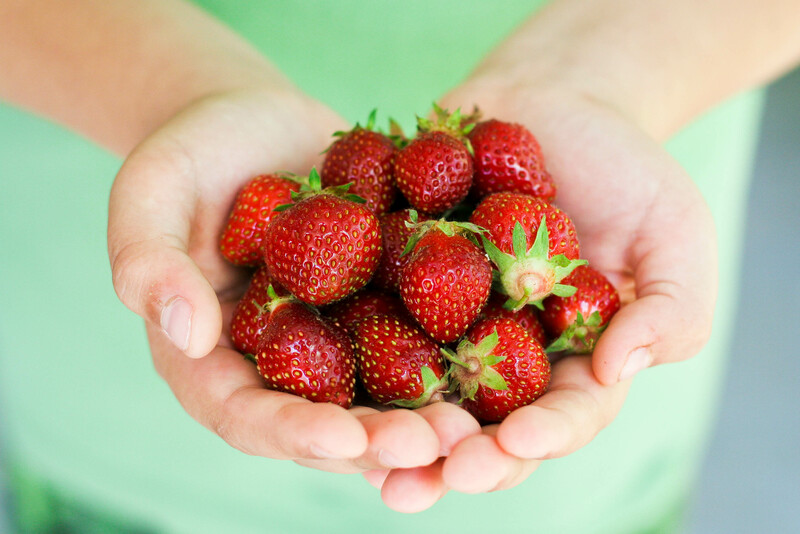 Write me at patience@kindnessgirl.com (include an address) and I will Ding Dong Ditch you a small box of strawberries from the fields of kindness…for reals! May your ultimate kindness, whatever it is for you, find you today!